Do you love the sound of acoustic fingerpicking blues guitar? Are you wanting to avoid long, boring and drawn out exercises that do nothing for your own creativity when learning to fingerpick your acoustic guitar? 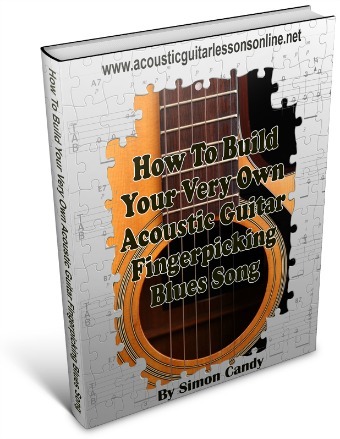 Want the "know how" of going about building your own blues song on your acoustic guitar? Great! Then lets take your fingerpicking skills to a whole new level NOW by not only playing, but building your very own fingerpicking blues song on your acoustic guitar. Blow your friends away, and anyone who hears you play, with your new found fingerpicking skills! Get INSTANT access to your FREE ebook and audio on building your own fingerpicking acoustic guitar song by typing your name and email address into the box below and clicking "Give Me Access Now"